The Bomkai saree, one of the traditional sarees of east India are created by the adept artisans who excellently define the tradition and culture of India by the simple work of needle. The traditional figured saree from the southern Orissan coastal plains is the Bomkai saree. This saree is named after the vilaage where it was discovered in early 1980s. Sonepur is located in the western part of Orissa. 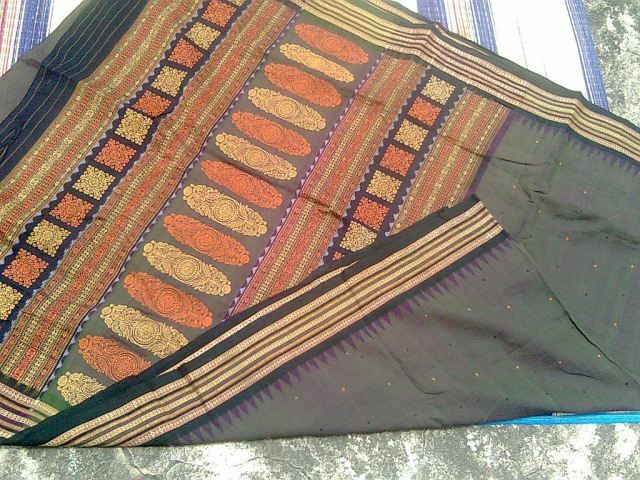 Sonepur hand loom woven sarees and dress material are known for their unique “Bomkai” designs locally known as “Bandha” design. 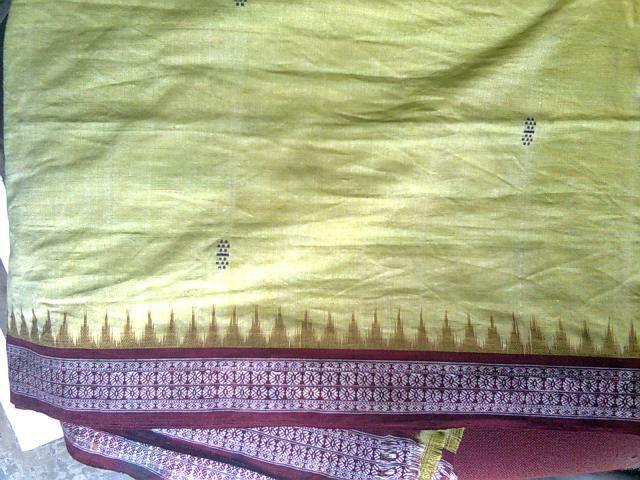 This Bomkai design on the fabric (especially on Sarees) is developed by using Jala technique on handloom. The art of weaving has been existing in this part of Orissa since 600 B.C. The scriptures in the caves of Khandagiri reveal this. By late 1980s, this hand loom cluster had begun specializing in silk weaving especially the Bomkai design (locally known as Bandha Design) without using any extra shedding mechanism like Jacquard and Dobby. The artisan of the locality used to create Bomkai sarees since the commencement period of the fabric. It was originally made for the local maharaja, aristocracy and Bhramins of the chikiti tahsilm of the ganjam district. The Bomkai design both the warp and weft is dyed according to the requirement. For border design, warp alone is processed, while for Palavas and anchal of sarees, weft is processed and overall saree designs, both the warp and weft are processed. Orissa still uses the traditional jaalas for weaving Bomkai. Wooden jaalas are used and are tied the traditional way by jaala bandhaks (weavers). The technique is in itself a furthering of the tie and dye technique. In case of Bomkai, the yarn is tie dyed but the focus is not on patterns which emerge out of tying and dyeing. It is used to get the contrast colours in the saree. So, a pallav or border may have a solid dyed block or can be double shaded. The ornamentation is worked using the extra weft technique or jaala system which gives the tapestry that kind of look. The borders are woven using what most weavers refer to as phool bandhaks which flow on the designs on the border. The double shades of the saree, the border and the pallavs are worked on the basis of colour combinations. Once the dyed yarn is fitted in the pattern is worked using extra weft technique. This gives saree an almost woven, carpet like effect. Recent innovations include the introduction of zari threads in weaving. While earlier the entire design was done in thread work with cotton or silk yarn as the fabric base. Nowadays, the saris are woven in both cotton and silk with brilliantly created angular discontinuous supplementary-weft patterns woven in the end-piece in contrasring colours. The Bomkai cotton saris have been influenced by tribal art, and are embroidered with temple spire patterns on the border. • MITKTA PANJI A broad band of supplementary-wrap patterning called the “ mitkta panji”, forming a latticework of small diamond shapes is the most popular border. • TEMPLE A row of temple spires which pretty much look like triangles is also a signature border of bomkai sarees. • KUMBHA A row of kumbha spires is favourite border motifs. • RUDRAKSHA The motifs in the borders include ubiquitous rudraksha or bead motifs. • FLORAL The florals and even plain bootis are also found. Bomkai patterns are hand woven from gold or silver colored silk threads. They embellish pallu of a saree. The sarees are brilliantly created with angular discountinous supplementary-weft patterns adhere to the traditional tribal motif of orissa, which includes geometric designs, birds, elephant and flowers. Other patters have such names as rukha (pestle, stick), dombaru (small hourglass-shaped drum), kanthi phoola (small flower) and karela (bitter gourd), shankha, peacock and fish. The motifs used are kanthiphula, Atasi flower, lotus and flies, birds, peacock, fish, elephants, ducks etc. in geometrical forms. PEACOCK – It represents a symbol of rebirth in the mythology of Hinduism, Buddhism and islam. In Hinduism, the image of the god of thunder, rains and war – Indra- is depicted in form of peacock. In India, it is also a symbol of love. The speciality of bomkai is the contrast border and heavy designs on the pallavs, while the blouses are again in contrast colours. Since, oriya sarees have close relation with jagannath culture, the four basic colours which commonly found on jagannath – black, white, red and yellow – is extensively used in oriya sarees and Bomkai is no exception. It is the design and colour palette that makes Bomkai stand out. The vibrancy of colour combination especially contrst colours are rarely seen elsewhere. Double shaded borders vie with single solid colour borders and this is the signature of Bomkai sarees. The contrast colours are beautiful such as yellow interspersed with black and a green border or peacock blue competing with golden border.the borders and pallav can be doubl shaded. It is the sheer contrast and eye catching colours which stand out such as grey teamed with a brilliant red, black with glazing golden border and pallav. Entry filed under: Arts and Crafts, Bomakai of Sonepur, Handloom Cluster of Subarnapur, Region watch, Subarnapur. Excellent presentation on the world famous weaving style of Sonepur which is a glory for the western odisha. This sort of economic activity is the real abckbone of the rural economy of the western odisha. More efforts are needed for creation of weavers group (on Self help Group Model) to provide more oppurtunities to the local youths. Sareebuzz offers desinger Lehenga and Saree for this wedding season. Best destination for designer sarees online shopping. Purchase most recent gathering of marriage Sarees and Lehenga Choli online best case scenario cost. Get free blessing on wedding Lehenga Choli, free conveyance & instant delivery.